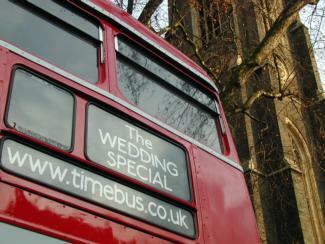 A Timebus provides a striking focal point for photographs of the happy couple and their wedding party. ...they can deliver your guests together in style to the ceremony venue (avoiding latecomers and parking problems there), and/or to the reception after the marriage. 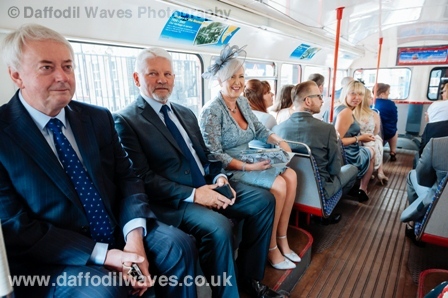 Some couples like to travel on the bus, mingling with their guests. Others prefer to make separate transport arrangements for themselves. 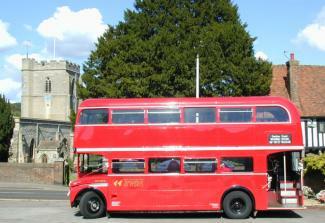 From A to B, the bus can take a scenic route or make a photocall on the way. Even if your ceremony and reception are to be held at the same venue, we can provide a circular tour for guests, creating some private time for the newlyweds and their photographer. Where the old route information used to be, we can display "the Wedding Special" or "the Celebration Special" if you wish. You may instead like a Personalized Sign made up and displayed on the front; for example, this could read "Congratulations Anne and Andrew". 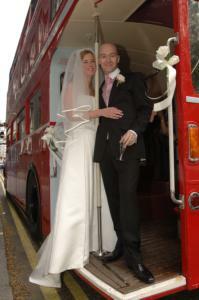 On Routemaster buses travelling from a church or register office, we can add "Just Married" under the display too! Our qualified in-house florist can decorate the bus(es) with ribbons and silk flowers around the entrance area, and around the bonnet of double deckers, free of charge. Bespoke Interior decoration with ribbons, fresh flowers or balloons may also be optionally available. If you have any other special requests, we will do our best to deliver them or work with you. 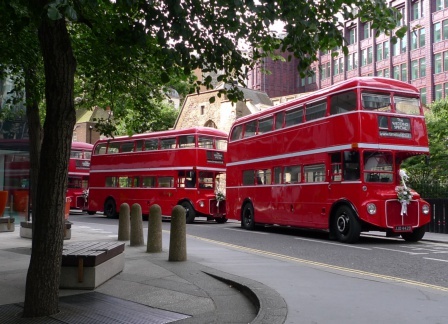 Frequently Asked Questions (FAQ) about Hiring from Timebus. Links to carefully selected companies offering high quality wedding related services. Environmental Statement, containing some tips on 'greener' wedding transport.